First cook the rice noodles in salted water until they become soft then drain them with a strainer. Immediately fry them with a bit of vegetable oil until they become tender. Remove and keep them aside. prawns and stir fry for a while. Set aside. Now place the rice noodles onto the plates and pour the hot mixture on top. We can decorate with a bit of sliced basil to contrast the colours and flavours. 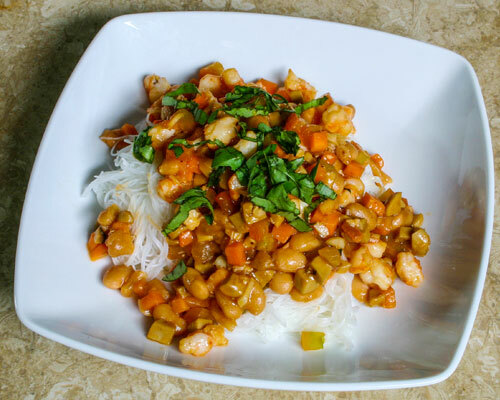 Comments: This delicious Asian style noodles topped with nature’s super food, baked beans is packed with proteins, fiber, vitamins & minerals and has wide range of health promoting benefits. The American Dietary Guidelines recommends the inclusion of at least half a cup of beans as a part of daily diet as it has been associated with lowering serum total cholesterol, cardiovascular risks, BMI, and diabetes mellitus. This recipe is loaded with 58% of our daily value of fiber which helps to helps to process fats, lowers cholesterol and slows the release of carbohydrates into the bloodstream. One serve of the dish provides about 92% of our daily value of selenium, a potent antioxidant that is known to prevent cancer.